Who made a pact with their teen self that they’d never say “in my day”…? I did, and I’m just about to break it. But rules are there to be broken, right? Music — both in its making, and consumption — was a very different beast in my day. I recorded my band’s unrefined noise-making onto a four-track recorder through a broken pair of headphones; I had a ghetto blaster that ran on fat D cell batteries; I spent the equivalent of £24 in today’s money on albums. My generation thought they’d got the measure of the digital revolution when we crammed the majority of our record collection onto 160gb iPods, and then a bunch of clever tech sods went and revolutionised the digital revolution with on-demand streaming. However, amidst these many new ways in which we can digest music, the humble home stereo has taken a bit of a bashing. Physical technology can barely keep up with the changing face of the music industry. 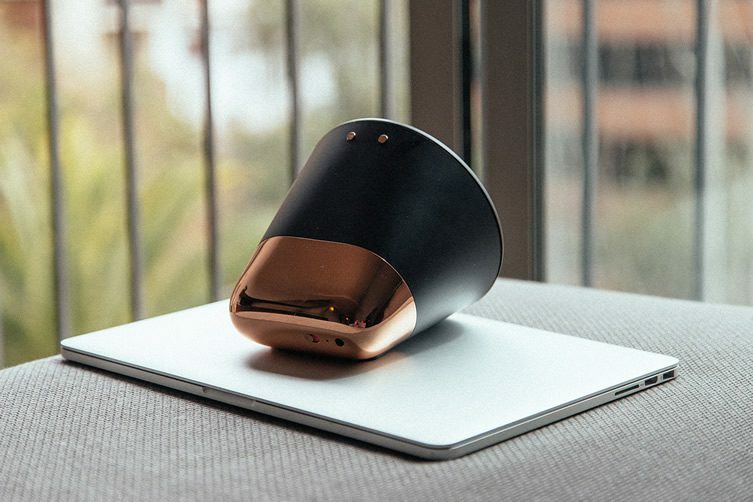 Incorporating a team with experience at companies like Google, Apple, Pixar and NASA — US brand Aether certainly have the assets to reinvent the music player wheel. And, in Aether Cone, have they? We caught hold of one a few weeks ago, and haven’t put it down since. 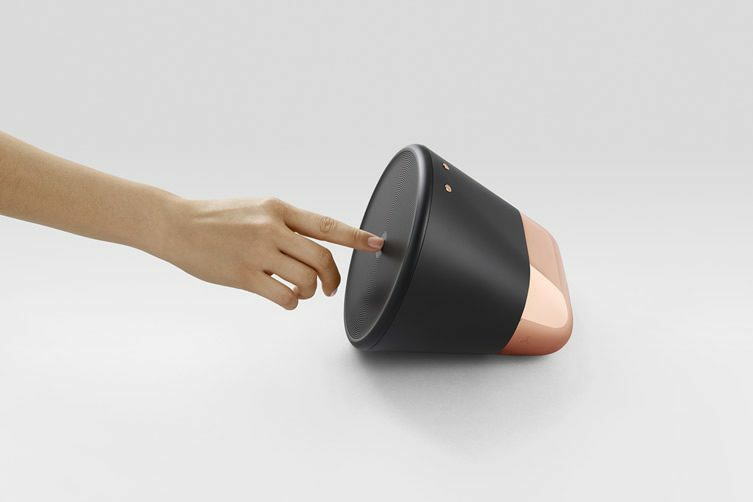 The PR bumf hails the Cone as ‘the thinking music player’ — it’s hard to counter their claims. Anything that’s been touched by those with experience alongside space scientists, the third rock from the sun’s biggest companies, and the folk who brought Buzz Lightyear to life will likely have innovation at its core — spoiler alert: there are no surprises to be had here. 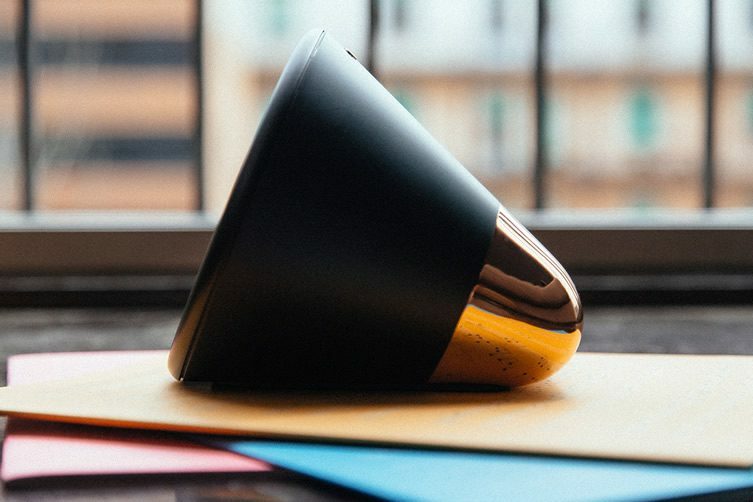 Harnessing the unlimited musical scope behind Rdio (the US-based thorn in Spotify’s side), Cone meets your exacting demands at the push of a button and — thanks to Nuance’s voice recognition technology — reacts to whatever you ask of it. 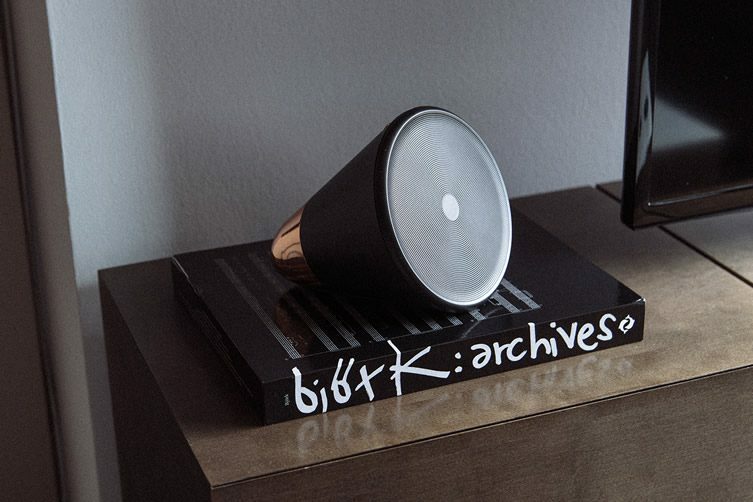 Sited atop new retrospective publication Björk: Archives, a simple request to “Play Björk” sees a quick spin of its central light before Army of Me comes bounding from the bass-heavy speaker. The sound is good; meaty, well-rounded — a welcome respite from overly tinny Bluetooth speakers. Buckling itself to your local WiFi, there’s no need for anything other than you and your voice to get Cone splurging sounds. A good-looking companion App enhances flexibility, but it’s a likeable trait that you can drop your digital devices entirely — get back to the relationship between you and music. 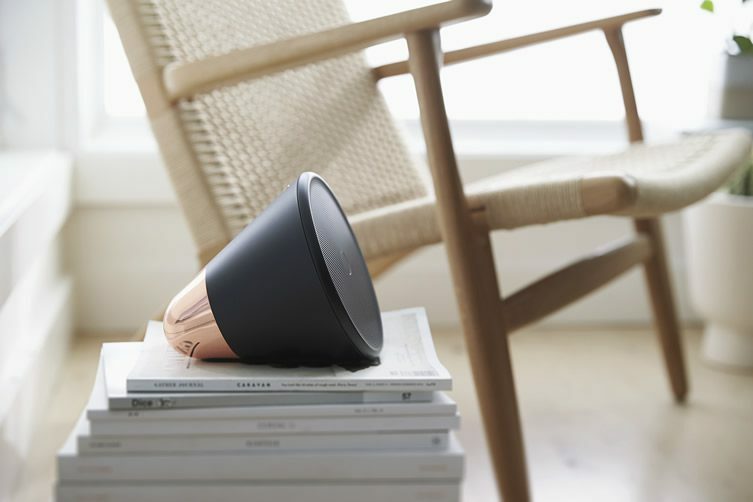 As you can see, Aether’s Cone is a real looker. The press photography comes over all Kinfolk — indeed, this little fella wouldn’t look out of place kicking back on some inordinately expensive furniture. “Play inoffensive, faceless guitar music” didn’t have the results I was expecting, though. Black and copper, white and silver, Cone’s neutral sophistication sets it up as a desirable addition to any slow-lifestyle devotee’s expertly curated living space. Back in the real world, we’re spinning the dial — another insignia of the hands-on heritage of music players. A little nudge replaces Björk with a similarly eclectic songstress, whilst a big sweep of the dial changes the mood entirely. Hair metal; gangster rap; noodling Scandinavian electronica. The big news, and clearly the workings of rocket scientists, is that Aether Cone will intertwine with your tastes, become your personal pilot to musical bliss. A bit tender on Monday mornings? 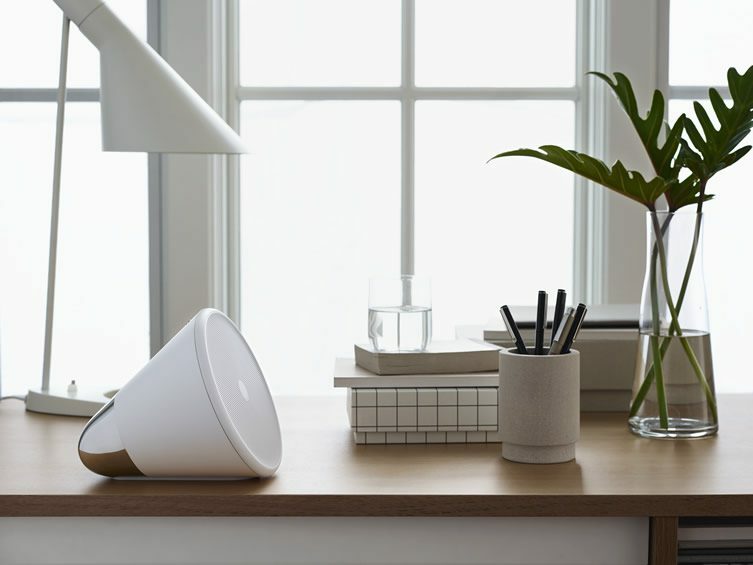 Cone will learn to select a soothing soundtrack. Get your dancing shoes on after work on Fridays? Your little friend knows the beats to make your booty shake. As somebody with exacting taste in music, I find Cone’s meanderings occasionally frustrating, but equally — when I’m exhausted of ideas, a few spins of the dial sees me discovering new sounds that I’m entirely partial to, and a quickly nosey at the companion iOS App tells me exactly what is playing. Pitched to a lifestyle market, Cone steps into that arena all guns a-blazin’ — Cone soundtracks your life, grows in your company. 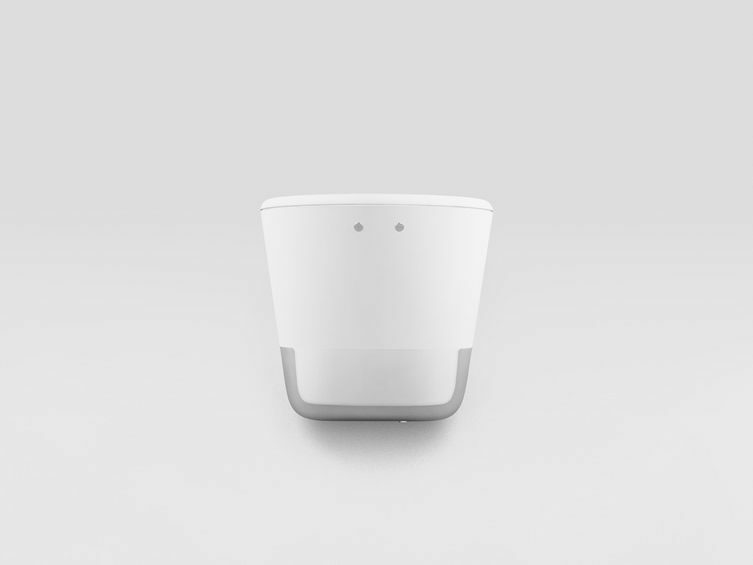 Realigning you with music, Aether’s little buddy exploits the bleeding-edge of technology whilst reintroducing the kind of offline, tactile enjoyment that the digital world rarely offers. Intelligent, reprehensibly good-looking, your new pal has the full package.